Researchers at St. Jude Children's Research Hospital have discovered the way toxic proteins linked to the most common forms of amyotrophic lateral sclerosis (ALS) and frontotemporal dementia (FTD) incapacitate membrane-less organelles inside cells. The toxic peptides directly interfere with the assembly and function of these essential compartments by disturbing normal phase transitions, the processes that allow membrane-less organelles to assemble and function. The findings appear online today in the journal Cell. The new work builds upon a previous study from St. Jude that was published in 2015. * That earlier work revealed how an ALS-causing mutation in an RNA-binding protein (hnRNPA1) disturbed the same phase separation process that leads to impairment of membrane-less organelles. "Our new findings help build a more cohesive picture of the molecular mechanisms for both of these debilitating neurodegenerative diseases," said J. Paul Taylor, M.D., Ph.D., a Howard Hughes Medical Institute (HHMI) investigator and chair of the St. Jude Department of Cell and Molecular Biology. "Researchers have identified many impaired processes within the cell when these diseases strike, but it has been more challenging to unite these findings into a unified mechanism. Our results help account for the many widespread cellular abnormalities observed in both ALS and FTD and set the stage for future studies to look at new drug interventions." It has been known for some time that the C9ORF72 gene that sits on chromosome 9 in humans is impaired in ALS and FTD. The "healthy" gene typically has a short sequence of DNA that is repeated around 20 times or less. People with ALS and FTD have hundreds or even thousands of these repeats that generate dipeptide repeat proteins. In a fruit fly model of both diseases, the researchers identified two arginine-containing proteins that are particularly toxic. When scientists looked at the effect of these proteins in their fly system, tissue degeneration was severe. "Nature would be hard-pressed to engineer a more potent toxin for membrane-less organelles than polymers of arginine," Taylor said. The team went on to systematically look at all of the proteins and other small molecules (the interactome) that these highly toxic dipeptide repeat proteins interacted with in human cells. "Our experiments revealed that the toxic arginine-containing peptides significantly interacted with RNA-binding proteins and components of numerous membrane-less organelles," added Taylor. 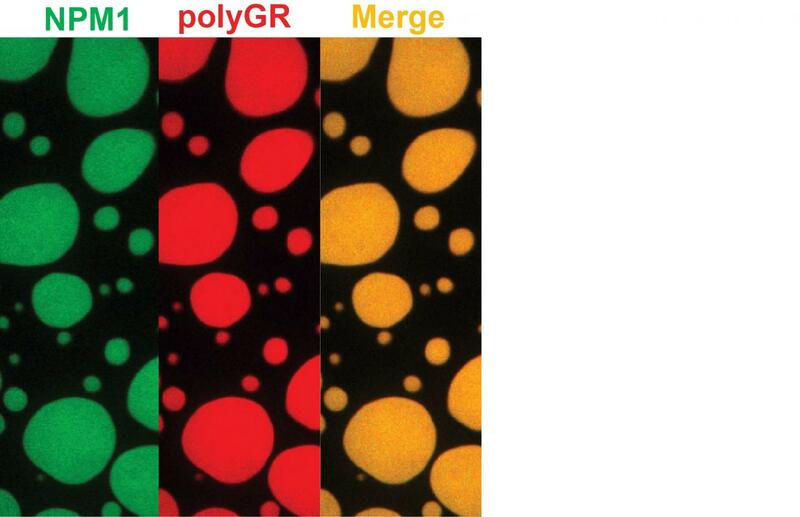 In further experiments, the toxic peptides were revealed to alter the phase separation of proteins that contain regions with low-complexity sequences. "Proteins with these regions belong to a class of intrinsically disordered proteins that make up about one-third of the human proteome," said co-author Richard Kriwacki, Ph.D., a member of the St. Jude Department of Structural Biology. "Because of their biological significance and links to disease, we have recently launched a Collaborative Research Consortium to understand the biology of these proteins in more detail." This consortium, a partnership between St. Jude researchers and collaborators at Princeton University and Washington University in St. Louis, will combine biophysical and cell biology studies to accelerate research into intrinsically disordered proteins that undergo phase separation. Ultimately, the work should help scientists develop new treatments for diseases that arise through alteration of this critical biological process. Membrane-less organelles depend on assembly mediated by phase transitions involving interactions of low-complexity domains in proteins. "In one example in the current study, we pinpointed the protein nucleophosmin or NPM1 as the target for the toxic peptides," Kriwacki said. NPM1 serves as the glue that holds proteins and RNA together in the nucleolus, a membrane-less organelle that depends on liquid phase separation to form and is the site for the biogenesis of ribosomes, the molecular factories that synthesize all proteins in cells. "Our findings connect toxic dipeptides arising from ALS and FTD with profound disturbances in phase transitions and the impairment of function of numerous membrane-less organelles. In addition to nucleoli, this includes damage to stress granules, nuclear speckles, Cajal bodies and other organelles," said Hong Joo Kim, a research scientist at St. Jude and one of the study's lead authors. * Molliex et al. (2015) Cell 163: 123-133. The current study's other authors are Peipei Zhang, Hong Joo Kim, Diana Mitrea, Mohona Sarkar, Brian Freibaum, Jaclyn Cika, Maura Coughlin, James Messing, Amandine Molliex, Brian Maxwell, Nam Chul Kim, Jamshid Temirov, Jennifer Moore, Regina-Maria Kolaitis, Timothy Shaw, Bing Bai and Junmin Peng.